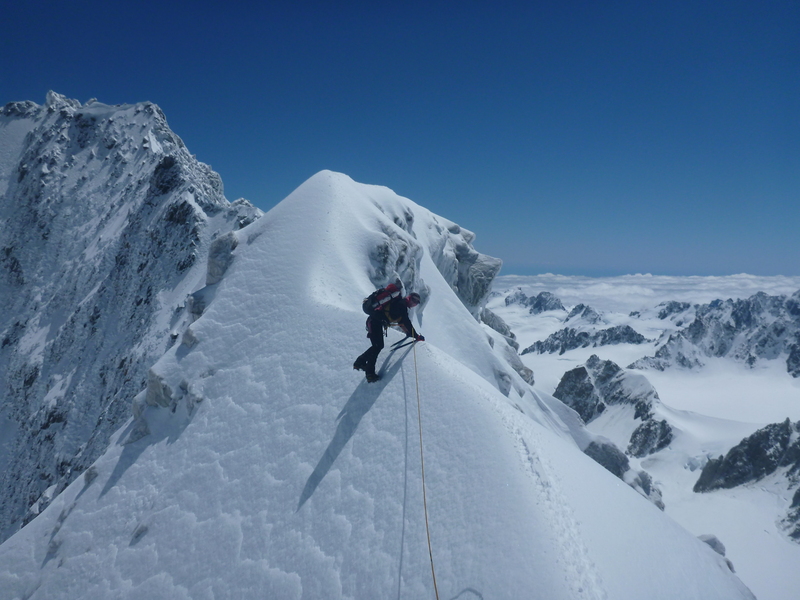 The below photo shows Alan Silva climbing the last few steps to the summit of Mt Dixon. Alan Silva nearing the summit of Mt Dixon, 4 January 2013. The rocky, snow-covered ridge line to his left, just past the summit, appears to have dropped off in the huge land slide on 21 January 2013. What is important to note in this photo is the rocky/snow-covered ridge line to the top left of Alan’s shoulder. In spectacular fashion, 3 days ago on the 21st January, an enormous chunk of this summit ridge of Mt Dixon fell off. It fell around 500m vertical metres to reach the glacier below, creating a massive landslide which spilled out an incredible 3 horizontal kilometers onto the grand plateau. 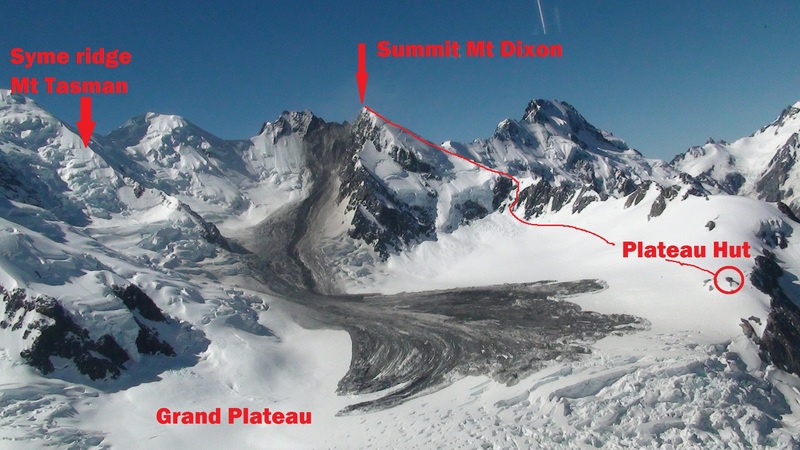 It narrowly missed Plateau Hut by only 200m (where we spent two nights before and after the Mt Dixon climb). No one was injured in the landslide, however it must have been a magnificent spectacle to witness at the time. Eye witnesses liken the noise created to “a 747 jet on take-off”. The image below shows the extent of the landslide. The image is courtesy of Alpine Guides. I have added the positions of the summit of Mt Dixon, Plateau Hut, Syme Ridge on Mt Tasman, the Grand Plateau and our route up Mt Dixon. You can see from our route that we chose a very sensible line, well out of harms way! Image taken by helicopter by Alpine guides. The red line shows our ascent route up Mt Dixon. Clearly evident is the ridge line on Mt Dixon where the landslide started. Plateau hut is circled in red. To give a sense of scale, the horizontal distance from the bottom of the ridge to where the landslide ended is 3km. The below video footage also courtesy of Alpine Guides shows the extent of the volume of rock and debris, and just how close it came to Plateau Hut. I also attach some links to interesting articles which describe more about the landslide. Seeing natural events occurring like this is so very humbling. The power of mother nature to unleash thousands of tons of rock from a huge mountain ridge hundreds of meters in the air in an instant and send it crashing down to the valley floor below for kilometers. All I can say is… WOW!! Posted on January 24, 2013, in Mt Dixon and tagged alan silva, image mt dixon ridge, landslide, landslide mt Dixon, Mount Dixon, Mt Dixon, Mt Dixon landslide, photo mt Dixon, rockfall mt Dixon. Bookmark the permalink. 2 Comments. Hi Kate, Nice to hear from you. Actually I have no real desire to climb Mt Everest again. My desire now is with more remote locations and more technical climbs. I am sure you will find some interesting characters to follow this year on Everest and do keep popping in every now and again to check out what’s happening.